I imagined how that moment would be a thousand times in my head; that moment she died. We knew it was coming, the doctors told us so. I played and replayed all of the different scenarios I thought possible in my head. How would I react the moment that I’d have to learn how to let go? Would I be yelling, “NO!” Would I return to the fetal position that she had just left behind? I thought maybe I would wake up and realize that this was all just a bad dream. I was so scared to face my new certainty in my life. I wasn’t scared, I was terrified. I wondered how Jim would react. Would he be delirious with grief or stoic and still? Would it be too much for him and would he leave me? Tears would well up every time I thought about it. The only way I was able to cope and get through each day was to push those thoughts out of my mind and tell myself that I would experience a miracle. That was the only thing that made sense. It wasn’t like anything I had imagined. It was peaceful. It was beautiful. The sensations that came over my body were indescribable. There was a physical, emotional and spiritual response. It was warm, so warm, starting in my toes and I felt it move up through my legs and into my chest until my entire body was light. I knew in an instant what was happening. The angels were with me and were there to take my baby. I felt like I was floating. The warmth that swept over my body felt like I was being cradled in a blanket of love and I was completely calm. I knew she was gone. I told my mom she was gone before the doctors could confirm it. The miracle came, it just didn’t come in the way I had expected it. Everything was moving slowly around me. The conversation in the room was all boggled together while I was trying to focus my sight on my baby. Our family had come back into the room and took turns meeting her. I stared at them while they stared at her, as she was passed from one person to the next, breathless. 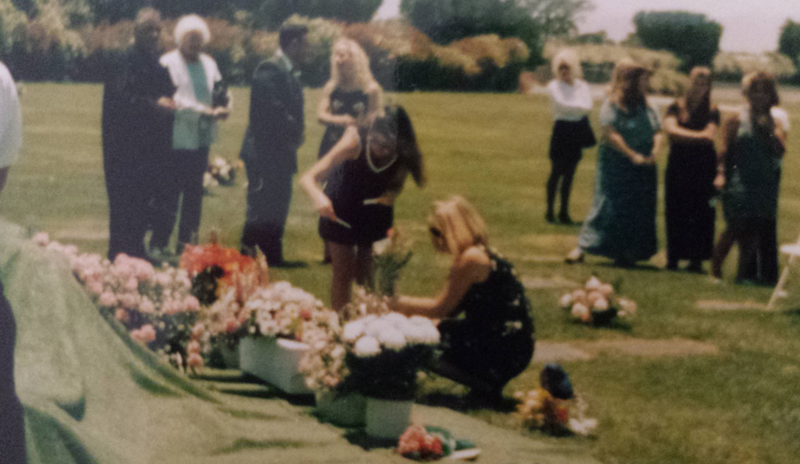 These memories took over my thoughts as Jim drove the ritualistic path back to the cemetery. We tried to visit her on the tenth of every month, because that was her birthday. Today was different; it would’ve been her first birthday. It would’ve been her special day. I was trying to not feel sorry for myself. The bitterness that filled my heart told me that I was pissed about not getting to plan a birthday party. I was jealous of my friends that had become mothers in the past few months. I was trying to not be angry that all I got to do was stuff a giant teddy bear Mylar balloon and a few pink latex ones into the back seat of Jim’s Chevy Nova. I held a mixed bouquet of flowers that leaked water all over my lap and stared at the butterfly I had attached to it. As Jim drove, I thought to myself how bad this still sucked. He lined his car up with the spray painted curb that read ‘compassion’. We knew she was exactly parallel with this word and about 100 yards out. If you walked straight out from the spray painted curb, then you’d run right into her grave. We could’ve done it blindfolded. We’d been there so many times, sometimes once a month, sometimes 3 times per week. It really just depended on our day-to-day emotional status. We pulled the balloons out and walked the familiar path to our daughter. They say a picture is worth a thousand words. That is why I’m putting this picture here. My worst nightmare was losing another child. Never, in my wildest dreams did I think I’d lose the same child, twice. The picture above represents the family and friends who chose to stay after the service for Machaela’s burial or until the grounds crew came. It meant so much to me because I knew how hard it was for everyone. Most of my support had already headed back to the reception. My parent’s best friends stayed to support them; they were really like second parents to me. Jim’s soccer friends stayed, to help him with our walk back to the car. I never expected that. 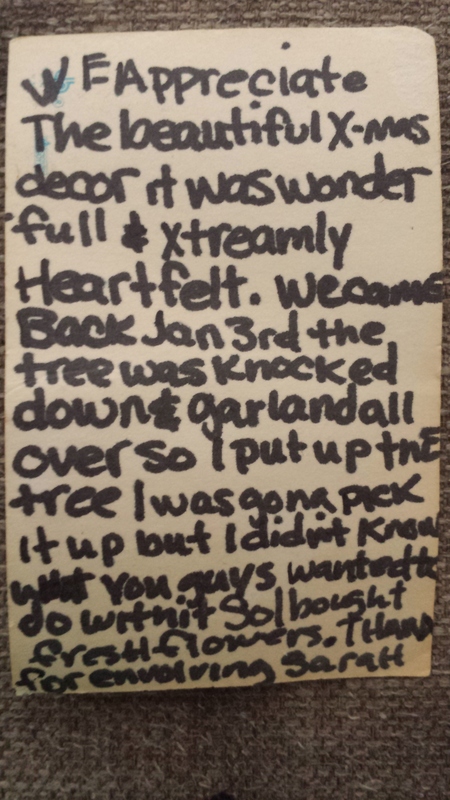 My mom, sister and sister-in-law completed the task of removing the cards, banners and trinkets left behind. I never would’ve been strong enough to do it myself. My in –laws hugged, supported and guided the guests on where to go next. I was too exhausted to answer their questions. Jim kneeled down, onto his knees, and held me tight, with inclination that he’d ever let me go. I did nothing but cry. I’m sharing this with you because when we got out of Jim’s car on Machaela’s first birthday we found out that Machaela’s headstone was gone. GONE! We walked our hundred yards from the morbid compassion spray paint, and it was gone. Was my baby gone too? We lost her; I mean we literally lost her! Where in the world could she be? I searched the grounds, tears flowing down my cheeks and the realization that I had failed as a parent came over me again. First, I couldn’t keep her alive and healthy and second, I couldn’t even keep her safe while she was dead! All of the grief, agony and pain that I suppressed for the last year came over me with a force that can only be described in biblical terms. The only thing that we found was a square patch of dirt where her headstone used to be. Flashes of the casket that I had burned into my brain a year ago came to the forefront. I would’ve given my ability to walk for confirmation that she was where we left her. We didn’t know what to do. That evening we called for help. We showed up at the cemetery a couple of days later. We walked the investigator to where we thought her grave was. Jim’s fingers intertwined mine, tightly, as we watched the investigator move from one grave to the next. He probed the ground with a long skinny device that measured the depth of the graves as he took notes in a flimsy journal every few minutes. He found her headstone. She was four feet down and ten plots over; just a grave away from ‘her friend’ Sarah Rose. 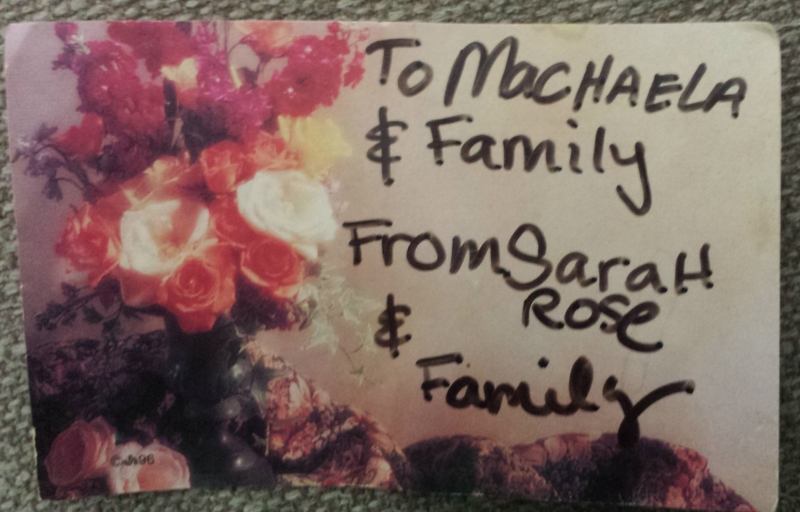 We met Sarah’s parents a few times, often decorating the graves at the same time for whatever holiday was among us. They were the same age as us and their daughter’s story was very similar to ours. It was an instant kinship. Jim and I would leave little gifts for their daughter as they would for ours. It had been a few months and we didn’t see or hear from them. 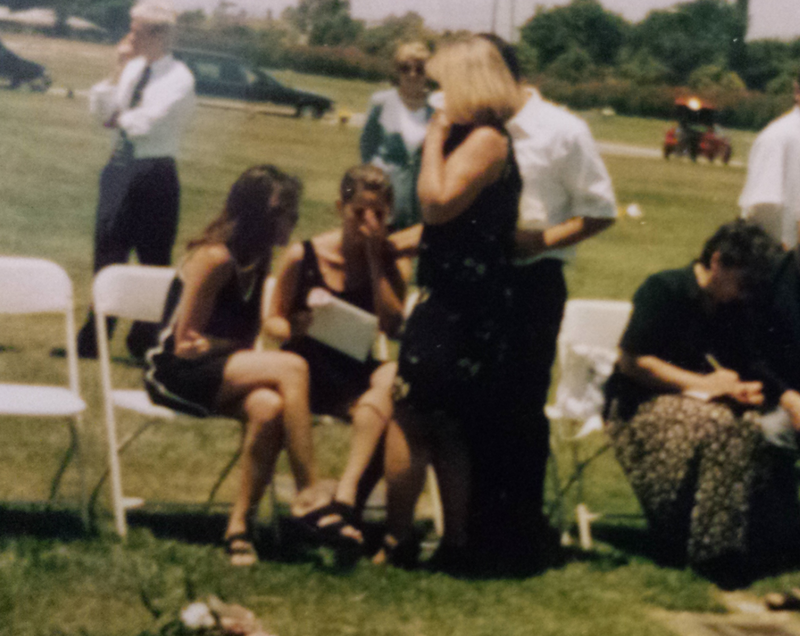 Then one day they left a sweet note and bouquet of flowers on Machaela’s grave. Their daughter’s headstone had been moved as well as ours. We would all be facing the same difficult decision. To exhume or not to exhume. That would be our next parenting decision. The investigator felt confident that the cemetery’s explanation of the moved headstones was valid. This involved eight families. Each of us had a choice. To exhume the babies and identify them or leave them as they lay. 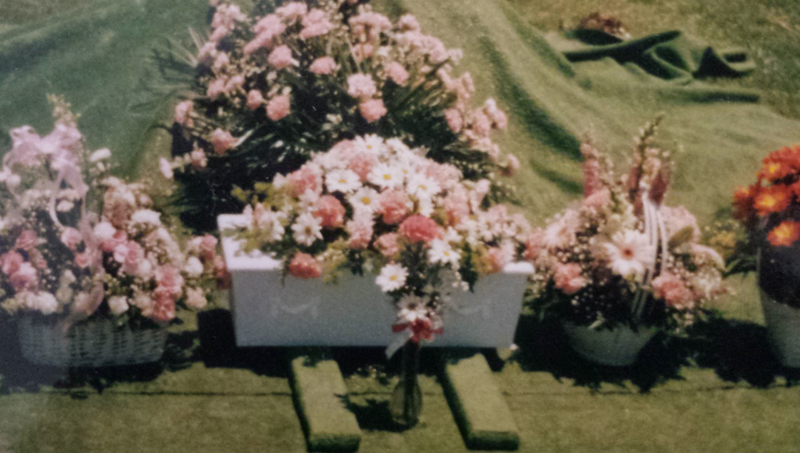 I couldn’t imagine facing a second burial of my baby. It was explained to us that at the time of Machaela’s burial, the grave markers were placed in the incorrect spot. Each baby that had passed after her, within days or weeks of Machaela, were also misplaced. 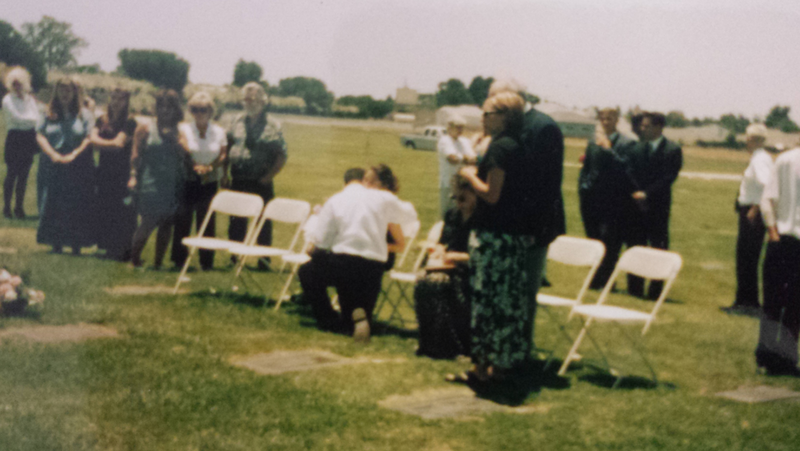 When the headstones arrived, usually weeks later, they were placed according to the incorrectly placed grave marker. After the probing and measuring, it was confirmed by the Investigator that our babies were in the graves they were said to be in. When the cemetery realized their mistake the headstones were moved and placed above the grave they should’ve been on in the first place. It is within the law to move them, not having to notify families as long as the bodies weren’t disturbed. The realization that we had been visiting an empty grave for a year broke my heart. I felt like I had abandoned her. Logic told me that it didn’t matter how, where or when I visited her, but what if she thought I never came back for her? We never saw baby Sarah’s parents again after all that. I’m not sure if it was too much for them to handle, or maybe they just moved away. We didn’t know. We prayed for them all of the time. I still think about them to this day. But your word has told me that You cared. And that my faith in you wouldn’t waver. I’m still trying to understand why this happened. For that my Lord, I must rejoice. All I wanted was to hold my baby. Help me to live through another day. although weak, still I pray. This entry was posted in Angels, faith, family, grief, Uncategorized and tagged Angels, anger, breakdown, brothers, dad, denial, despair, Faith, family, funeral, god, grief, happiness, healing, hope, hurt, loss, love, mom, moving forward, overcome, parenthood, parents, prayer, searching, sisters, strength, support, teaching, triumph, wisdom. Bookmark the permalink.